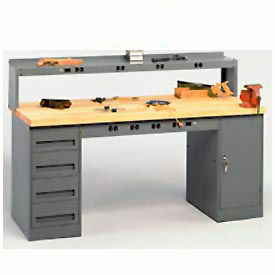 Stackbin Double Pedestal 3 Drawer/Cabinet Workbenches Are Used For Workshops, Garages And Other Heavy Duty Work Settings. Stackbin Double Pedestal 3 Drawer/Cabinet Workbenches are constructed of 16 and 18 gauge spot welded and bolted steel with a butcher block or plastic laminate top for versatility and long lasting durability. Provides cabinet pedestal and three drawer pedestal with two 5 inch drawers and one 11 inch long drawer. Ships fully assembled. Simply bolt to bottom of any work surface. Design allows addition of workbench accessories. Top constructions are Butcher Block Square Edge, Plastic Laminate Safety Edge, Plastic Laminate Square Edge and Plastic Laminate w/T Molding. Colors are Black, Blue, Gray. Draw lengths are 16 in. and 23 in.. Height is 30-1/4 in.. Top thickness is 1-3/4 in.. Available in a variety of widths and depths. Pedestal Workbenches Are Used For Customized Workstation Needs In Commerical Or Industrial Applications. Pedestal Workbenches are made of heavy gauge steel and coated with textured two-tone black and red powder coat finish for long lasting durability. Functional and modular, each major component can be stand alone or in conjunction with other major components. Measures 18"W x 24"D x 32"H. 1 shelf; 3 or 6 drawers. 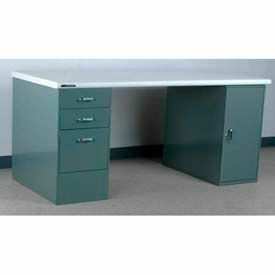 Stackbin Pedestal Drawers Are Used For Workspaces Or Personal File Organization. 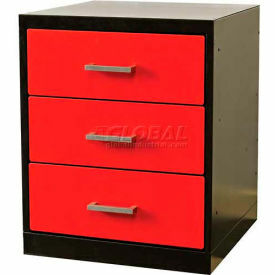 Stackbin Pedestal Drawers are made of 16 & 18 Ga. Spot Welded & Bolted or 18 Ga. Spot Welded for long lasting durability. Drawers can bolt together to create a modular drawer workbench that can be reconfigured at any time. Drawers are 3, 5, or 11 inches high. Weight capacity of 75 lbs. 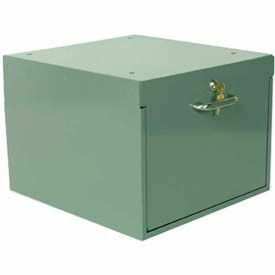 Available in Drawer, Drawer W/Lock, File Drawer and Steel Drawers. Color finishes are Black, Blue and Gray.